I love a good vampire tale, a ghost story, or werewolf adventure. 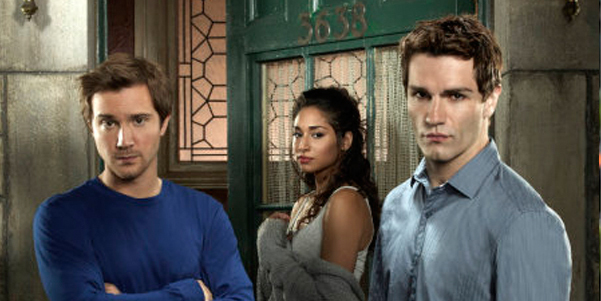 When SyFy started doing promos for the American version of a British show set around the premise of werewolf, a vampire, and a ghost as roommates, of course I was intrigued. I hadn't been aware of the BBC version until then. So, I did what any good enthusiast would do - I stalked down the BBC originals and started watching. Along the way I was also watching the American version. There are parallel story lines, of course, but there are also places where the American version strays onto a different path. I won't tell how different or how alike they get because I don't like spoilers - and certainly don't fancy being the one to ruin anything for someone else. What I will say is that they are both equally deserving of your time if you have any love at all for the supernatural. I will say, I am partial to the BBC version. Maybe it's because I have seen those characters through three seasons (series) of the show already or maybe it's the cougar crush I have on John Mitchell, played by Irishman Aidan Turner. Eight years isn't that big a difference is it? No, not really. At any rate, these are great shows! There is so much human drama tossed all about with a healthy portion of supernatural that you can't help allowing yourself to be drawn in. Both shows have very rich and humanly flawed characters that stick with you long after you finish an episode. This is must see TV for anyone who, like me, enjoys an imaginative tale and all the things that go bump in the night. As to who wins the battle - well - I guess that's up to you to decide!